New Hi-Res Shots From ‘Batman V Superman: Dawn of Justice’! New crisp, hi-res shots from the upcoming Empire Magazine have hit, giving us some new looks at the main players in Batman V Superman: Dawn of Justice. At first I was digging the new batsuit but the more I see, the less I love it. Earlier I was speaking to a friend about the images and he brought up a lot of solid points. All of the proportions are just weird for Affleck in the batsuit. His head looks giant, his neck is like a tree trunk, his legs look too thick… all around he looks too bulky to be as limber and acrobatic as Batman is supposed to be (Even an older DKR era Batman). I honestly can’t tell if they’re trying to represent that those are his real muscles in the suit, if that’s the case they’re failing. 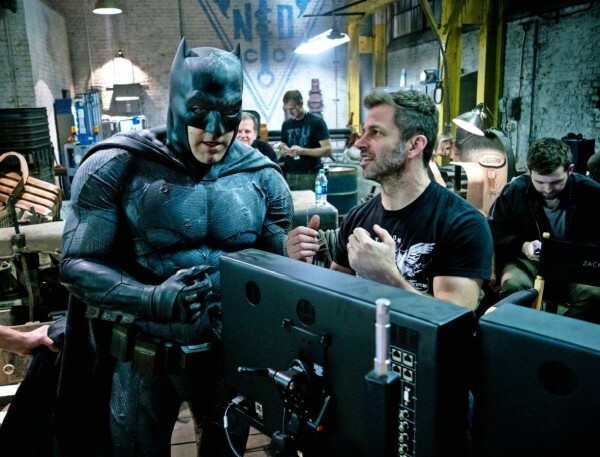 Also, why does the batsuit look like it was designed on Krypton? I get that Snyder is looking to make his Batman as close to Frank Miller’s Dark Knight Returns Batman as possible, but a literal interpretation of that comic book version just looks weird in the “Real” world he’s trying to establish. It’s as if Snyder ultimately was wishing he could throw a cowl on Mickey Rourke’s Marv from Sin City and call him Batman. You can’t aim for super-realistic world and have your Batman look identical to Miller’s comic source material, it just doesn’t translate well. Take Temple of Doom for instance, even with the cartoony elements, the John Williams score throughout punctuating and shaping moments, the comedy and horror and action all treated in the same stylized manner they are able to get away with every plot hole, every impossible stunt. These films taking themselves SO seriously that it ultimately weakens the final product, it puts the spotlight on every ridiculous impossibility. You have to balance it out if you want people to accept the ride and not focus on the stuff that doesn’t make sense. I don’t feel like they’re doing that at all with these films. It seems these days, if you have anything critical to say about DC it means you’re a Marvel fanboy and vice versa. I’m not picking a side in this East Coast/West Coast rap war. The side I choose to be on is the great movies side. There’s plenty of room for both companies over here. This entry was posted in Breaking News, DC, Film and tagged Ben Affleck, DC, DCCU, gal gadot, henry cavill, zack snyder. Bookmark the permalink.